Honestly, we were surprised by the number of cool things to do in Orvieto. 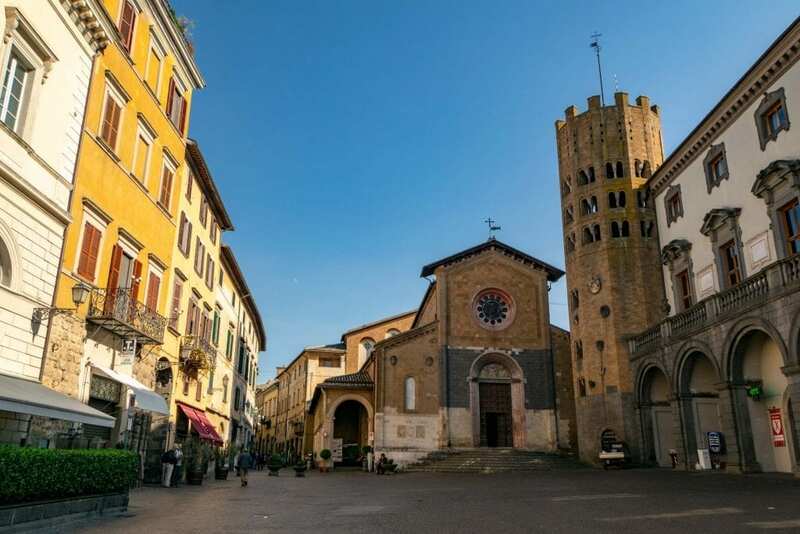 We’ve had our eye on this adorable hilltop town for a while: with its long history dating back to the Etruscans and picture-perfect setting on a cliff in Umbria, we were eager to explore its back streets, check out its Duomo (because every Italian town needs a Duomo! ), and sample its delicious food. Beyond that, though, we really had no idea what we would actually do there until we booked some train tickets and started planning our trip. And to our surprise, it turns out that there are plenty of fun things to do in Orvieto! 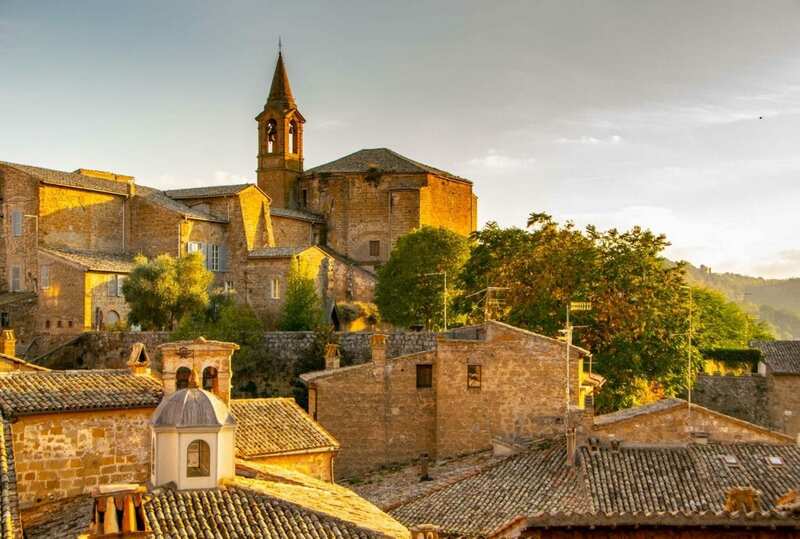 Orvieto was one of the most important cities in the region during Etruscan times, and (much) later served as a home for the pope–with a history like that, it should come as no surprise that the Orvieto of today is an engaging and multi-faceted place to visit. Heading to this charming piece of Umbria soon? 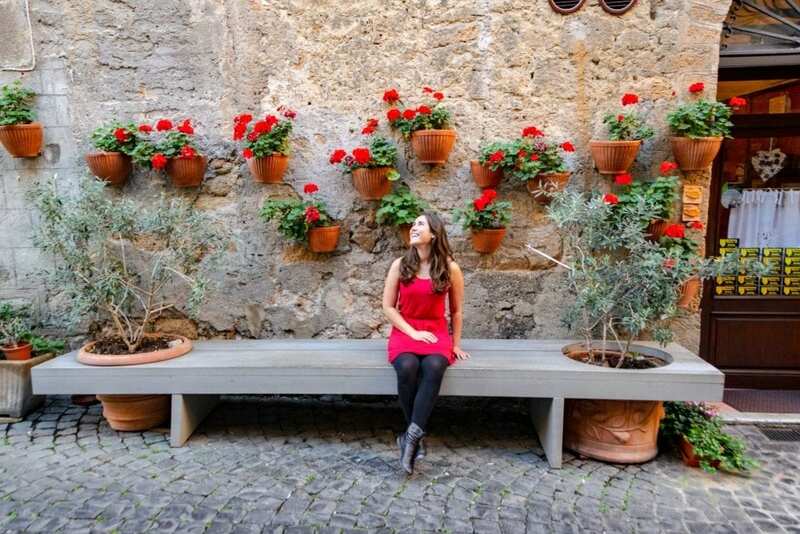 Here’s what to do in Orvieto. Marvel at the Orvieto Cathedral. 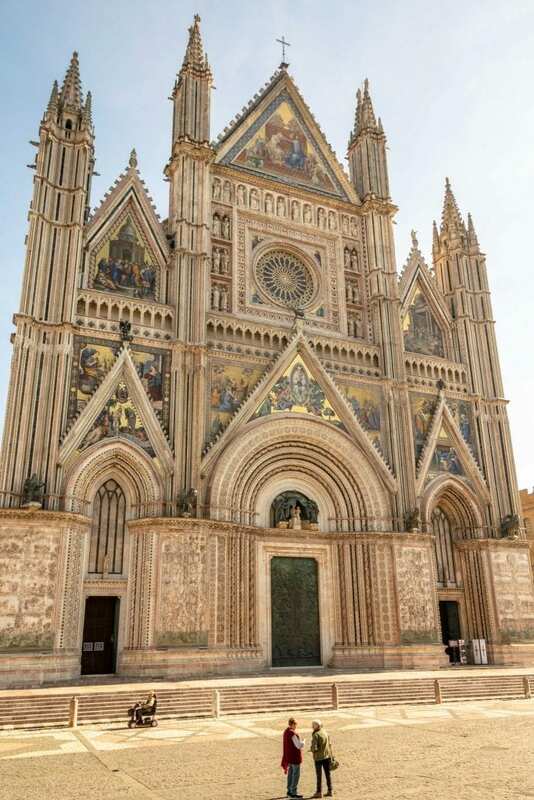 Orvieto’s Cathedral (usually known as the Duomo, as in most cities in Italy) has one of the most beautiful facades we have seen–the carvings and mosaics on the Duomo practically demand that you plop down in the Piazza del Duomo and properly admire it for a few minutes. Once inside, be sure to check out the Cappella di San Brizio! While most of the interior of this Duomo is rather stark, this small chapel is absolutely magnificent–and disturbing. The depictions of hell on the ceiling, complete with flying demons, countless acts of violence, and streams of blood, are some of the creepiest we have come across. Did you know that there are 1200 caves under Orvieto? Each one of them is man-made, some dating back as far as the Etruscans, and each has been put to good use. 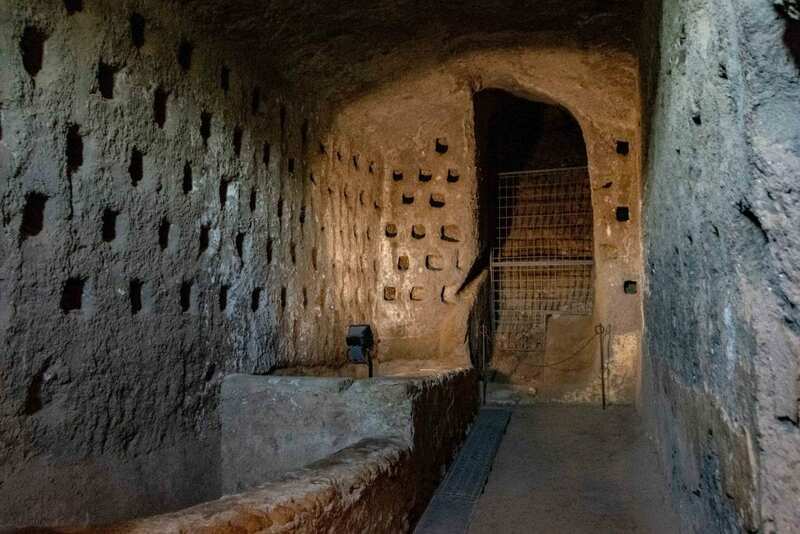 Be sure to add a tour of the underground to your list of things to do in Orvieto–it’s amazing to get underneath the city and learn more about the many, many uses the caves have had over the years. 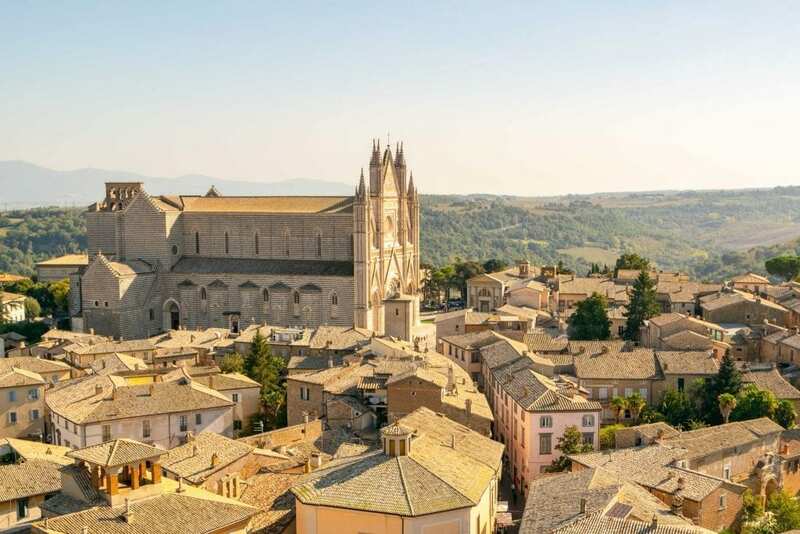 Unlike most things to do in Orvieto, this one does require scheduling (slightly) in advance–we recommend heading to the tourism office in the Piazza del Duomo when you arrive and signing up for a tour, and then structuring the rest of your time in Orvieto around that. … And also the Pozo della Cava. The Pozo della Cava is a privately owned cave in Orvieto, and gives you a great opportunity to learn more about the history (their detailed, multilingual signage was impressive!) and to get up-close-and-personal look at one of Orvieto’s many wells. Descend into St. Patrick’s Well. While you can peer into the well at the Pozo della Cava, at St. Patrick’s Well, you can climb all the way down inside! 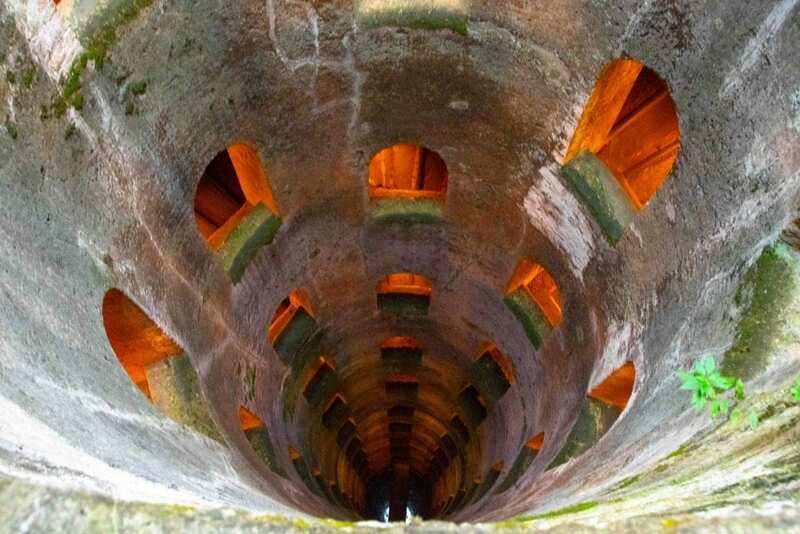 It’s beautiful and eerie to look up and see the perfectly cylindrical well reaching 175 feet above your head, and definitely an experience worth adding to your list of things to do in Orvieto. Give a pigeon dish a try. Seemingly every small village in Italy has its own local dish or food associated with it, and in Orvieto, it’s pigeon. Pigeons were originally farmed in the caves under Orvieto, though today they’re produced in more modern facilities. For a truly local meal, order the pigeon (in Italian, “piccione”) for lunch! Check out Etruscan artifacts at the Museo Claudio Faina. Claudio Faina was a private collector of Etruscan artifacts, but his collection (and the stunning palazzo it is housed in) are now open to the public. The museum is located right across from the Duomo, so be sure to duck in for a quick look at Etruscan history in Orvieto! View the ruins of an Etruscan necropolis. It’s not every small town that can say they’re the home of a 2,500-year-old cemetery, but Orvieto can! Several distinct graves–complete with inscribed family names–can still be seen at the necropolis. … And also the ruins of the Temple of Belvedere. This Etruscan temple was probably built to honor the god Tinia, the Etruscans highest god, and remains of the temple can still be seen to this day. Certain artifacts that have been found there can also be seen in the Museo Claudio Faina. Soak in amazing views at the top of the Torre del Moro. No trip to an Italian hilltop town could be complete without visiting an amazing viewpoint, which makes climbing the Torre del Moro one of the best things to do in Orvieto! On a clear day, you can see all across Orvieto and beyond into the Umbrian countryside, and the views are absolutely breathtaking (as is the climb, and there is no elevator option). Head to the Archaeological Museum. 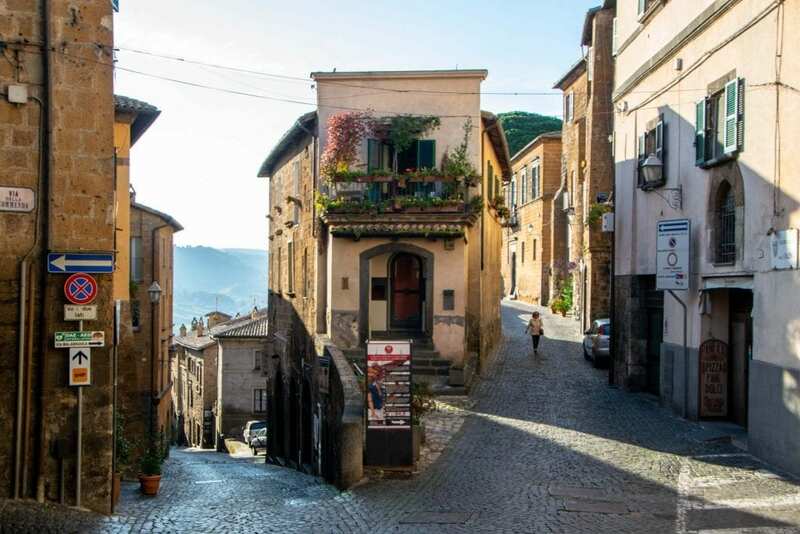 It’s hard to imagine today, given Orvieto’s status as a charming yet tiny Italian town, but Orvieto was one of the most important cities in Etruscan culture. In addition to the Etruscan archaeological sites in Orvieto, the Archaeological Museum offers a fantastic opportunity to view Etruscan artifacts and to learn more about Etruscan history and culture, which will give excellent context to your visit to Orvieto. Stroll through the Albornoz Fortress. Built in the Middle Ages, this castle-like fortress stands at the edge of Orvieto–if you arrive in town via the funicular, it’ll likely be the first thing you see in Orvieto! Today, the fortress is mostly used as a public garden, complete with an amphitheater for performances and absolutely stunning views of the surrounding Umbrian countryside. Stop by the Piazza della Repubblica. Long the center of public life in Orvieto, this small piazza may not be the most picturesque, but it’s an unmissable spot in Orvieto. Home to the town hall to this day and once the center of the city’s religious life (until the Duomo was erected on the edge of town), it’s worth noting the Piazza della Repubblica on your list of things to see in Orvieto. Step inside the Church of San Giovenale. Standing proudly on the edge of Orvieto, this charming church boasts a long history: built in 1004 on the site of a former Etruscan temple, it has the feel of a weathered building that has seen many things come and go during its life. The interior is still partially decorated with frescoes, so be sure to stop and take a peek inside! … And then enjoy the nearby views. The Church of San Giovenale stands on the edge of town… which means the nearby views are absolutely stunning. We spent a long time blissfully admiring the countryside from one of the benches situated at this vantage point, and other than the occasional meandering local with their baby or pup, we had the view all to ourselves! Taste the Orvieto Classico wine. 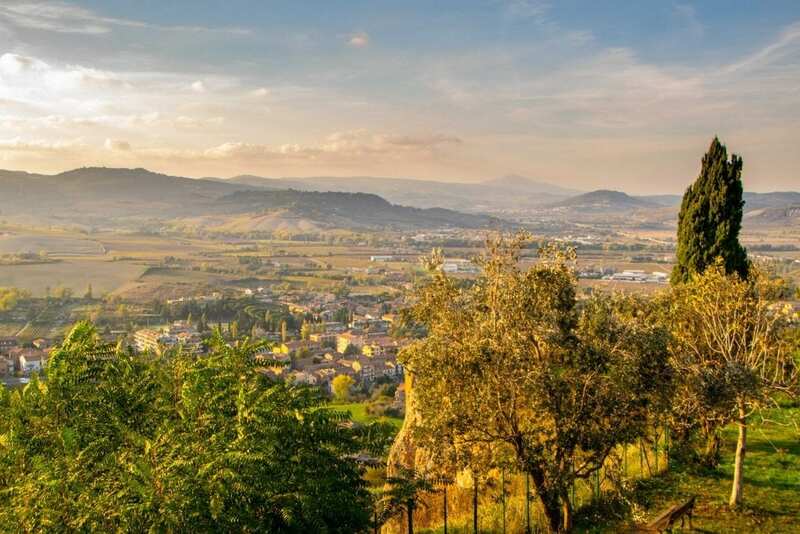 In addition to being a town, Orvieto is also the name of the surrounding wine region! 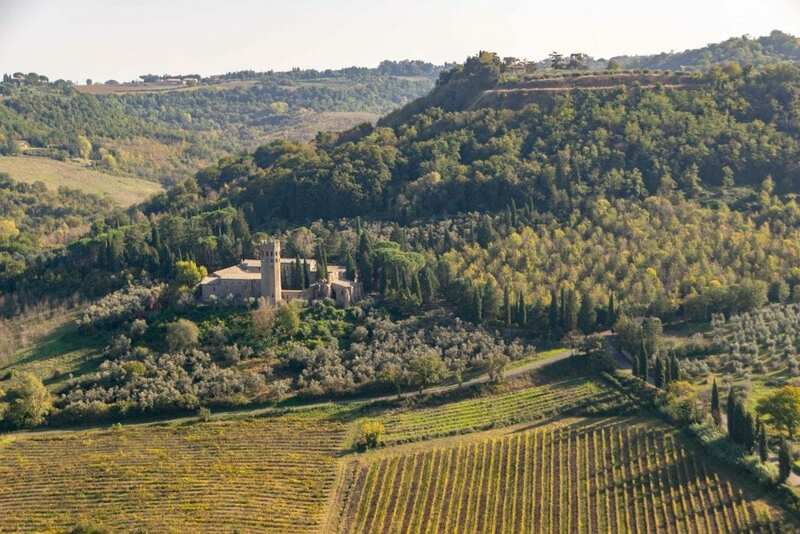 Known primarily for its white Orvieto Classico wine, wine lovers should be sure to order a glass while exploring Orvieto–or even to visit a nearby vineyard to add a wine tasting to their list of things to do in Orvieto! 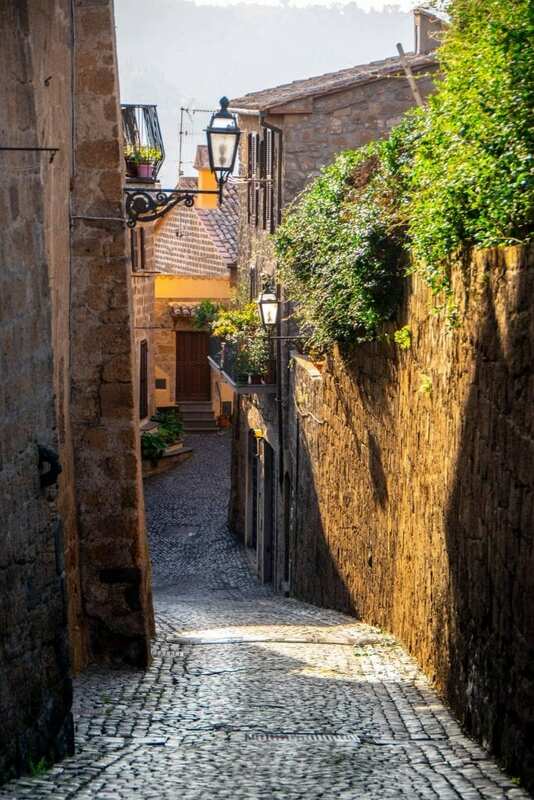 Spend hours exploring the small streets of Orvieto. 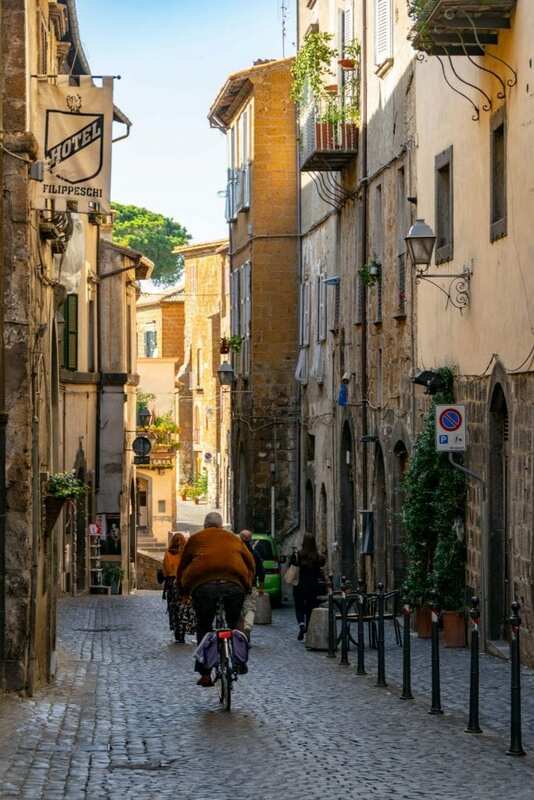 One of the best things to do in Orvieto is quite simple: wander the streets. It’s simply not possible to get too lost here–you’ll always be a short walk away from something familiar–but it’s lots of fun to simply turn down random streets and see what turns up. Beautiful homes, charming small businesses, quiet corners, and plenty of adorable dogs are just waiting to be found. We loved every moment of our visit to Orvieto, but if we had to pick just a few favorites, the quiet moments spent wandering streets at random would definitely be among them. For 20 Euros, you can purchase the Orvieto Card, which covers nine of the most popular things to do in Orvieto (including the Duomo, the underground, St. Patrick’s Well, and the Torre del Moro), as well as round-trip public transportation to the old town from the train station via the funicular. If you’re going to be doing quite a bit of sightseeing in Orvieto, we recommend picking up the Orvieto Card as soon as you get to town–preferably before you pay for the funicular up! The cards are sold at all participating attractions, the train station, and the tourism office across the piazza from the Duomo. If you’re so inclined, the card can also be used for small discounts at certain local restaurants and shops. 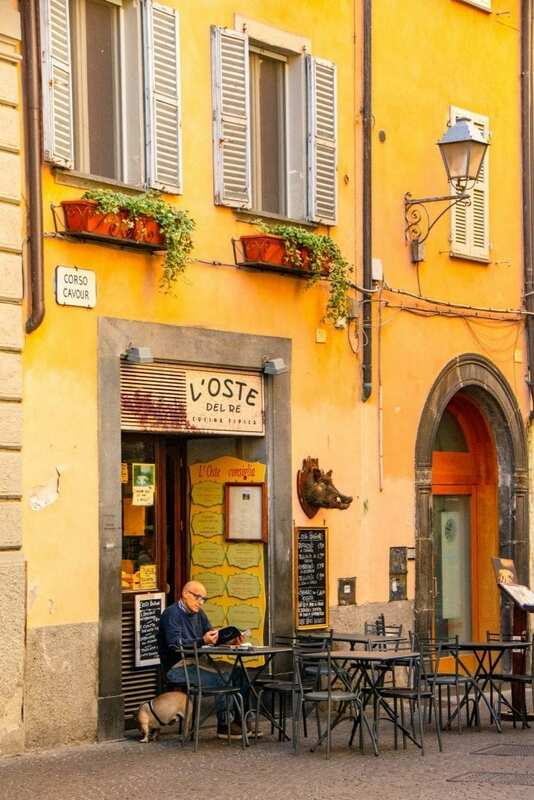 Orvieto is easily accessible via train from both Florence (about 2.5 hours travel time each way) and Rome (about 1.5 hours travel time each way) and is an easy day trip from both cities. You can also drive to Orvieto, which is a great option if you’re hoping to see some smaller sights and attractions along the way. However, you’ll need to secure parking for your car before ascending into Orvieto’s old town–you can’t drive there without a permit! Orvieto is tiny, and once you ride the funicular and/or escalators up into the old town, you won’t need to do anything other than walk to get around! During our time in Orvieto, we walked directly from one side to the other in less than half an hour, and we weren’t moving particularly fast. One day in Orvieto is plenty of time to see all the major and some of the minor sights, and we recommend visiting as a day trip from either Florence or Rome. 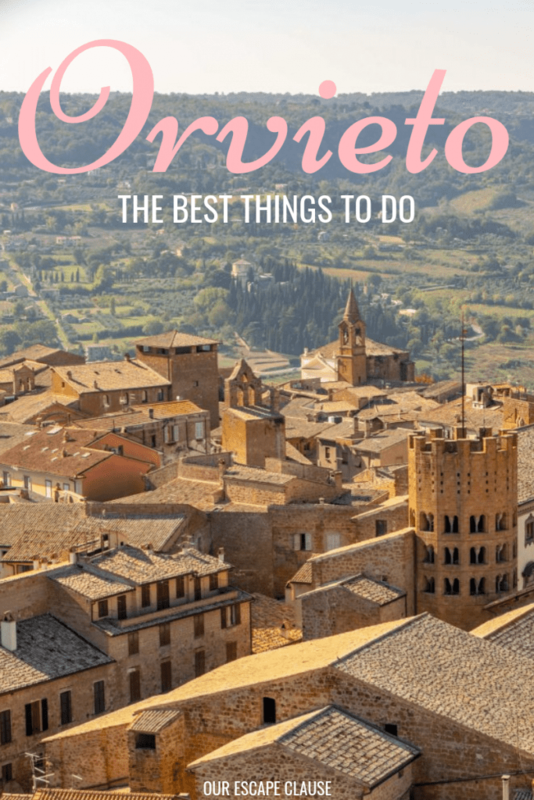 Even though we loved discovering how many interesting things to do in Orvieto there are, unless you only want to relax in a beautiful setting, anything beyond a day is overkill for Orvieto. If you would like to spend more time there, consider exploring Umbria beyond Orvieto, starting with the nearby wineries! Orvieto is so pretty! I have never heard of this place before but it looks so charming. I love little winding streets and that cathedral is BANANAS! Also bananas? That pigeon is eaten! I guess you can’t knock it until you try it! Thanks for the tips! My husband, teenage son and I recently spent 6 days/5 nights in Orvieto. I completely agree with you that it is charming, beautiful and fascinating. The only point I would disagree with is that more than a day is overkill. After 6 days, none of us were ready to leave. I’m glad you had such a wonderful time! Orvieto is certainly beautiful.